The Tax Cuts and Jobs Act has made the tax code more favorable for small businesses. Still, owners will want to take full advantage of every legal tax break they can find. The following deductible business costs could help reduce your 2018 tax bill. Be sure to consult with your tax professional before you take any specific action. Business owners who operate out of a qualifying home office have two available claiming options, either of which could result in a larger deduction. Whichever option the taxpayer chooses, the eligibility criteria are the same. To qualify for a deduction, a home office must be used in a trade or business — not to manage personal investments or pursue a hobby. It must also be used regularly and exclusively for business. Under the original method, eligible taxpayers can write off a percentage of home expenses such as depreciation, rent, property taxes, insurance, utilities, maintenance, and repairs. The percentage is based on the square footage of the office space relative to the total size of the home. A newer, simplified option allows taxpayers to claim a flat $5 per square foot of the office, up to 300 square feet. Thus, the deductible amount is capped at $1,500. This simple formula doesn’t take home expenses into account, so it’s easier to figure out and generally lightens the recordkeeping burden. However, business owners with relatively high home expenses may be able to claim more than $1,500 for a home office if they use the more complex calculation method. If your business relies on the use of one or more vehicles, it pays to consider the potential tax implications, such as whether to take the mileage deduction, lease versus buy, and depreciation. Small businesses can take a deduction for auto expenses based on the number of miles traveled using the standard mileage rate (54.5¢ per business mile for 2018) plus parking and tolls. An alternative method involves adding up the actual costs, including lease payments or vehicle depreciation, car maintenance, and gas, for vehicles used at least 50% for business purposes. 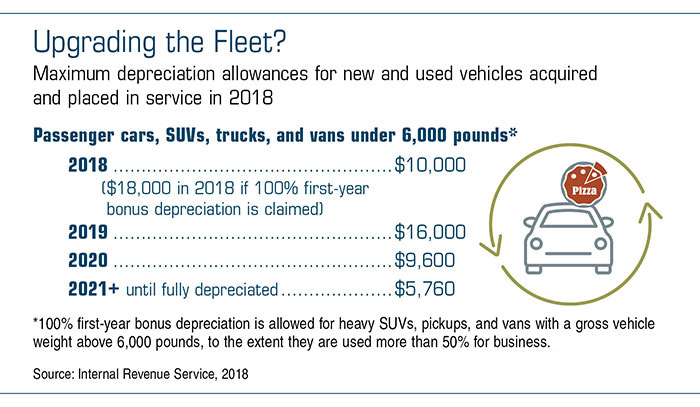 In 2018, the first-year depreciation deduction for “luxury” vehicles has become significantly more generous thanks to the Tax Cuts and Jobs Act. The IRS generally expects taxpayers who claim vehicle deductions to keep a log that tracks the date, destination, purpose, and odometer readings for each business trip.